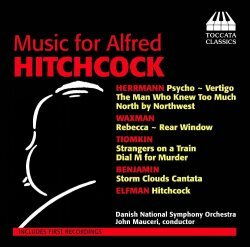 What a feast this promises to be; some of the finest Hitchcock scores in arrangements by the distinguished American conductor/arranger John Mauceri. Throw in a very decent orchestra and this release looks even more tempting. Admittedly, such collections tend to be somewhat bitty, and the success of suites hangs on the arranger’s ability to meld morsels into a dramatically and musically cohesive whole. However, the absence of striking visuals and the manipulative power of montage – both Hitchcock specialities – can leave the listener with a curious sense of disjunction. Hollywood owes an enormous debt to Korngold, Herrmann and Waxman. Korngold never worked for ‘the master of suspense’, but Herrmann and Waxman most certainly did. Indeed, they are responsible for no fewer than twelve Hitchcock scores between them, all of which contribute to the cult status of our portly auteur. That said, even the most committed Hitch fan would agree that not all his films were of the highest calibre; Under Capricorn (1949) and Family Plot (1976) come to mind; still, that’s pretty impressive in a career that spanned more than half a century. There ‘s nothing second rate about the films featured on this album. Indeed, the thumping overture to The Man Who Knew Too Much (1956) pummels the ear and pushes up the pulse rate. Goodness, those soundtracks were seldom this visceral; as good overtures often do, the piece anticipates the mighty cymbal clash in the Albert Hall that marks the assassin’s cue. The concert work in question, Herrmann’s arrangement of Arthur Benjamin’s Storm Clouds Cantata, is included here. However, it’s not quite as arresting as I’d hoped, but then Hitchcock’s tension-building cuts between Doris Day and the curtained box – not to mention the cymbal player – make this one of the most thrilling and theatrical sequences in all cinema. Happily the cantata is one of the few disappointments in this otherwise admirable collection. The suite fashioned from Waxman’s score for Rebecca (1940) is much more to my liking. Now tense, now fulsomely romantic this is compelling music, very well played. There’s some delicious woodwind playing, but it’s the frisson-inducing timps and bass drum that benefit most from this big ’n’ beefy recording. Mauceri really whips up a storm here, trembling strings and baying brass to the fore. All the film’s classic images tumble forth, the fluttering Rebecca (Joan Fontaine) trapped between her icy husband Maxim de Winter (Laurence Olivier) and the horribly hawkish Mrs Danvers (Judith Anderson). Voyeurism is a central theme in many of Hitchcock’s films; remember that long opening shot in Psycho, in which we’re drawn through a sightless window and into Marion Crane’s love nest? In Rear Window (1954) the incapacitated photographer ‘Jeff’ Jefferies (James Stewart) spies on his neighbours with binoculars; obsessed with imagined lives, he’s oblivious to the very real charms of his girlfriend Lisa Fremont (Grace Kelly). Again Mauceri makes a handsome suite from Waxman’s svelte and slinky score. The piano part is particularly apt, but it’s the energy and rhythmic verve of the piece that really stands out. Any caveats? I would have liked a little more sheen to the violins, but otherwise this is most enjoyable. Russian-born Dimitri Tiomkin scored one of Hitch’s darkest pictures, Strangers on a Train (1951). The young and gullible tennis player Guy Haines (Farley Granger) is accosted by the needling psychopath Bruno Anthony (Robert Walker), who suggests the perfect murder. The result is a poisonous cocktail of hubris and thinly veiled homoeroticism. Mauceri melds sweep, drama and suitably chugging rhythms in this taut, driving suite. Appropriately enough Dial M for Murder (1954) features former tennis player Tony Wendice (Ray Milland) who plots to kill his wife Margot (Kelly again). The suite isn’t one of Mauceri’s best – it’s awash with swash à la Korngold - but those shiversome gong-strokes are very menacing indeed. Much more assured - and dramatically apposite - is Mauceri’s suite based on Herrmann’s now giddy, now passionate score for Vertigo (1958). Just as Rear Window majors on voyeurism Vertigo takes Hitch’s preoccupation with falling to another level; witness Fry’s dramatic plunge from the Statue of Liberty in Saboteur and Eva Marie Saint dangling from Mount Rushmore in North by Northwest. It’s also a tale of love, obsession and dark secrets, whose musical counterpoint of agitated strings and muted timps raises more than a few goose-bumps along the way. This is one of those scores that tends to signpost its emotional peaks a little too emphatically. Thankfully Mauceri’s nicely modulated suite retains the drama but plays down the histrionics. As a currency the term iconic has been debased through overuse, but it’s the only way to describe North by Northwest (1959). That falling motif is reiterated in the late Saul Bass’s vertiginous opening titles. As for the urgent, skittish overture it’s just terrific. Mauceri and his players – the on-the-ball timps especially – are wonderfully crisp and propulsive from start to finish. For anyone who is interested the film has been refurbished and it looks ravishing on Blu-Ray. Not to be missed. After that Mauceri’s take on Herrmann’s Psycho: A Narrative for String Orchestra seems rather tame. Those slashing strings – so reminiscent of Prokofiev – certainly don’t have the edge and impact one might expect. Also, Mauceri’s somewhat relaxed pace doesn’t help. As for the famous shower scene the plunging bass as Marion slides down the tiles and her blood circles the plughole is particularly subdued. That said, one has to remember this isn’t a film score per se, but a piece for strings based on themes from Psycho. As such one needs to adjust one’s expectations accordingly. Sir Anthony Hopkins played the lead role in the 2012 film Hitchcock, for which Danny Elfman provided the music. Frankly, in the company of so much substance his music for the film’s end-credits isn’t terribly nourishing. Incidentally, I would recommend the BBC/HBO film The Girl, which came out at about the same time. Toby Jones is superbly sadistic as the insecure, blonde-obsessed director, and Sienna Miller is excellent as Tippi Hedren. I really don’t want to end on a bum note. This selection of film music is a very good example of the breed, and there’s no doubting the conductor/arranger’s authority and commitment to the project. His forces also deserve praise for their energy and enthusiasm. As for the audience you wouldn’t know they were there; the only applause comes after the cantata. The liner-notes – threaded with interesting bits of film trivia - are very readable; a pdf version is available with the download. Despite one or two flat spots this is a very entertaining album; a good recording, too.